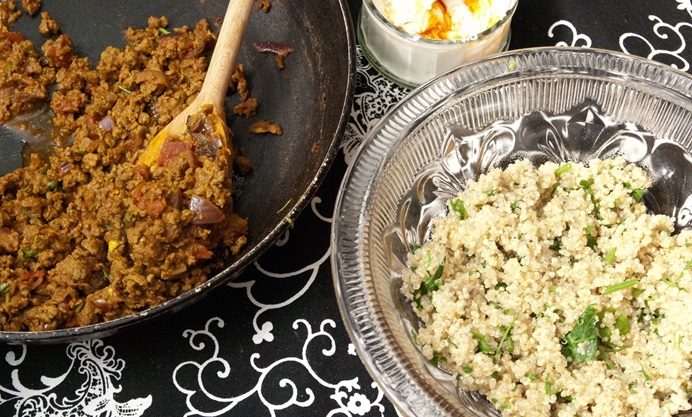 Selina's Moroccan-spiced Quorn recipe will fill your kitchen with heady aromas, with a superb mix of cinnamon, cumin, turmeric and ground coriander flavouring the mince to perfection. Topped off with harissa yoghurt and served on a bed of bulgur wheat, this is a quick and nutritious midweek meal to have up your sleeve. We love cooking Moroccan inspired dishes in our household, whether it's a slow-cooked, flavoursome tagine, herb-flecked cous cous, or a steaming bowl of harira. The rich depth of sweet and spice always magically works in these dishes, whether it's adding in apricots, sultanas, honey or fresh herbs to lift vibrancy in recipe, it results in something comforting and moreish. 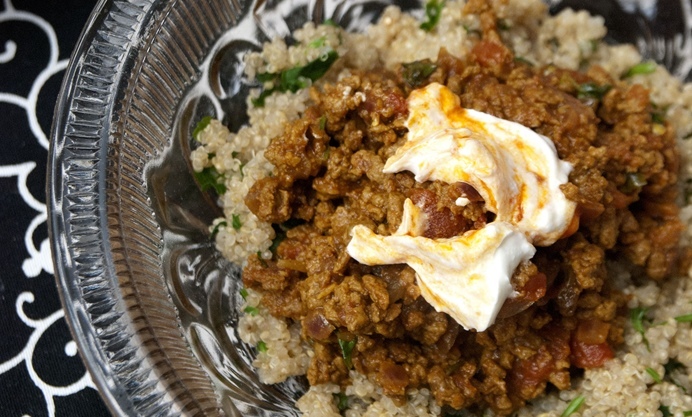 On this occasion we decided to try out a Moroccan-style mince dish, which makes for a quick midweek supper and a great addition with cous cous or bulgur wheat which I used in this case. 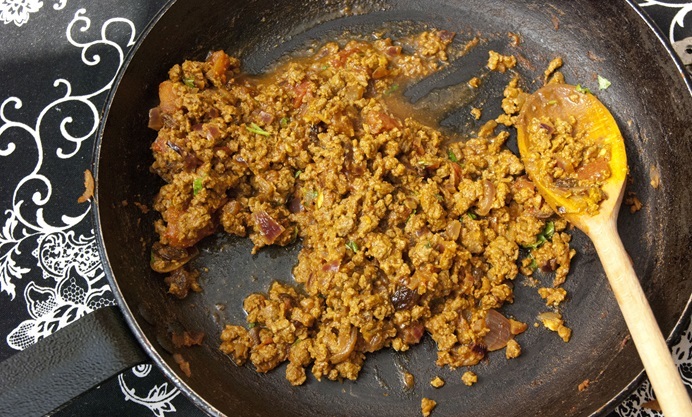 I decided to try out using Quorn mince as an alternative to using lamb or beef mince, to add a lighter, less meaty feel to midweek supper, a great alternative for vegetarians too who can still enjoy this spiced dish. The Quorn mince took on the spices of cinnamon, turmeric and cumin really well, even the lovely yellowy tinge. The mince did not have to be browned and it literally cooked within 10 minutes to take on the flavours. 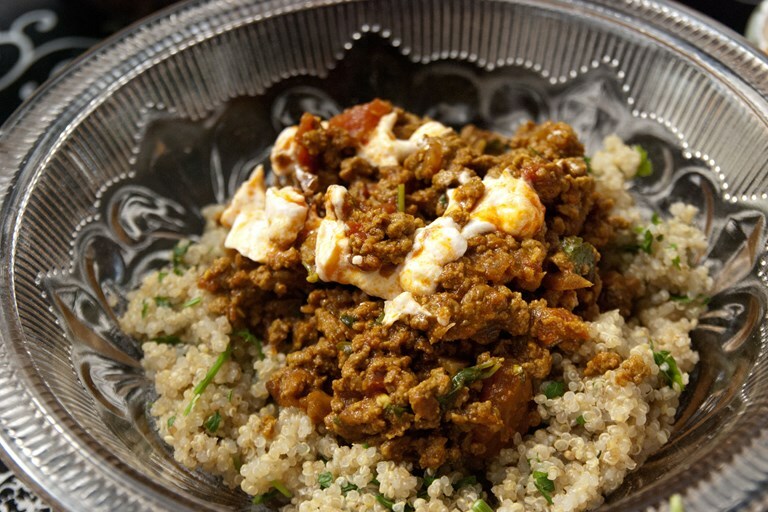 Topped with a spicy harissa yet cooling yoghurt, and on top of a vibrant fresh herb bulgur wheat, this makes a perfect one bowl dish.